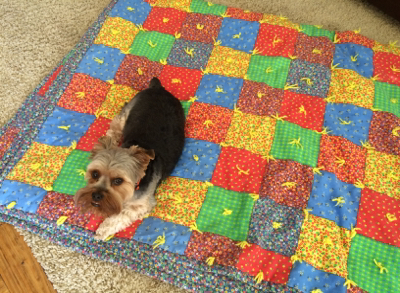 Throw Back Thursday to the first quilt I ever made. Circa 1977. When I was 14, the young women in our church group tied quilts to put in our "hope chests." My mom and I went to downtown Provo, Utah, where we purchased this SUPER COOL calico cheater cloth at House of Fabrics. My friends and I tied this quilt and then for years it sat unbound in a closet. By the time I actually got married, I thought this quilt was hideous. But MANY years later, my mom bound the quilt and brought it to my home. I still thought it was ugly, so it sat on a shelf for many more years. Then my youngest daughter found it when she was a teenager and laid claim on it. This SUPER AWESOME quilt has now been to too many high school sporting events, concerts, and trips up the canyon, to count. It stays in the trunk of Jocelyn's car, ever ready for the next adventure. From time to time she brings it home and I wash and fold it. Now I look at this quilt with love and admiration for my dear friends who helped tie it. They are women of strength, who go about doing good. So much love and goodness in one quilt.